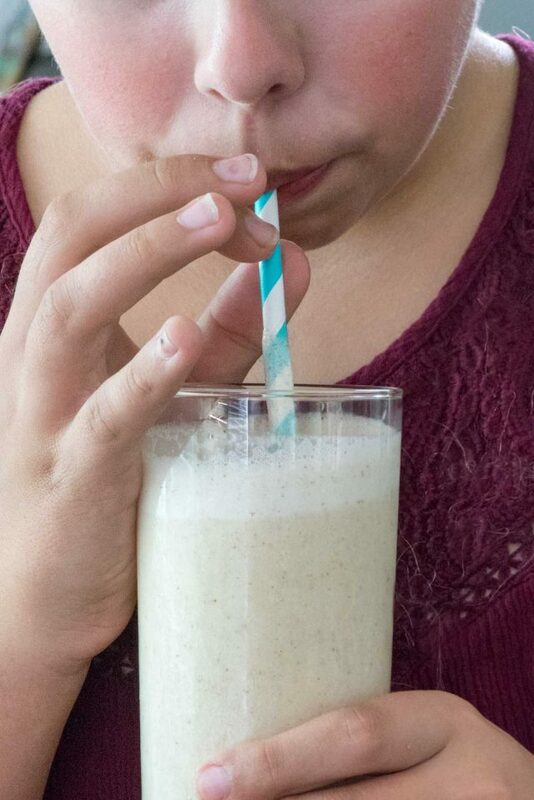 Honey Banana Smoothie – this easy smoothie recipe is full of bananas, honey, and almonds and kids LOVE it! It’s just the right amount of sweet with some healthy and the perfect breakfast! This post is sponsored by Almond Breeze. I always hear parents say “my kid loves smoothies and they’re so healthy!” and I wonder what kind of smoothie they’re feeding their kids. Jordan loves smoothies too, but usually the kind with tons of juice or yogurt inside and I wouldn’t consider them very healthy…especially when she drinks it with a side of cereal for breakfast. I’ve tried for years to get her to like smoothies with banana or almond milk and she’s just never been that interested…until now. This past June we went to Santa Monica for a few days. Each morning we’d walk to a new place for breakfast and one of the coffee shops had super expensive smoothies. (I’m talking $9 a pop, but hey, with the rents in So Cal I didn’t really bat an eye; that price is expected.) She didn’t really like anything on the menu so she was all, “I guess you can just order me a honey banana smoothie” and I was like okay here’s $9 for something that will go in the trash but whatever it’s vacation! We all should be happy! Anyway, they handed her a pretty large smoothie and we headed back to our hotel…and she’d sucked the entire thing down before we got halfway back. Then, the next day she begged me to get her another one…and when we got home she asked to learn how to make it herself. She now makes herself a Honey Banana Smoothie at least once or twice a week! 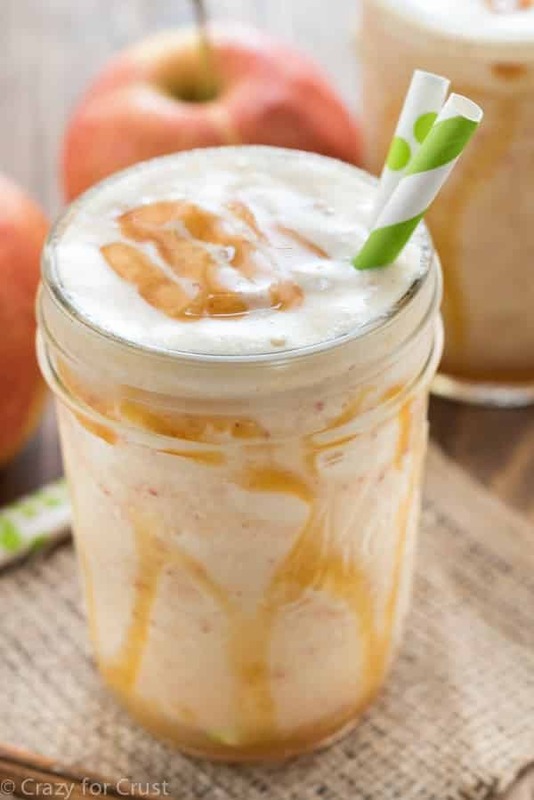 A Honey Banana Smoothie is full of almond milk, almond butter, honey, and banana and is the perfect breakfast or snack! There are just a few ingredients in this smoothie recipe: a banana (of course), honey for sweetness, almond milk for blending, and almond butter for flavor and protein. I also added ice and sometimes I add chopped pitted dates and/or whole almonds for some extra flavor. Really, you can use what you have, and you probably have all the ingredients in your pantry already. 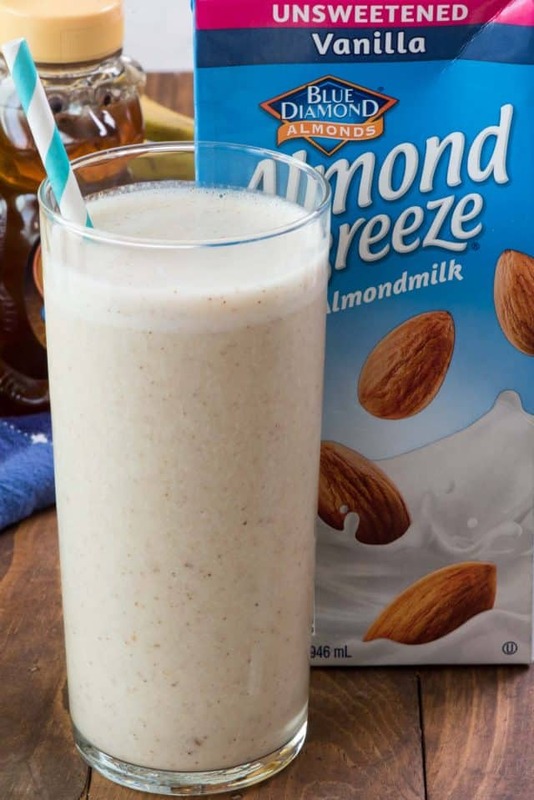 I love using Almond Breeze Almondmilk for my smoothies. 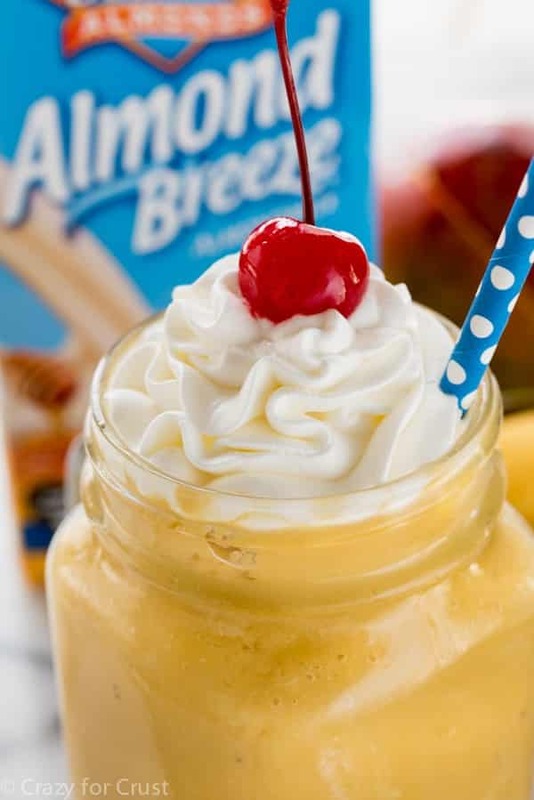 I’ve said it before; we use Almond Breeze in everything (smoothies, cake, French toast) and I love their Unsweetened Vanilla Almondmilk on just about everything. It’s my go-to milk for cereal too. Usually I buy the refrigerated kind but sometimes I pick up the shelf stable one; they taste identical. You can use any kind of Almond Breeze Almondmilk in this smoothie (I’m also partial to the Almondmilk Cashewmilk blend). I like that it’s a great start to the day or a great snack for after school. Sometimes I’ll make it for myself and add some protein powder to keep me going throughout my workout too, especially on busy school mornings when I don’t feel like eating early. 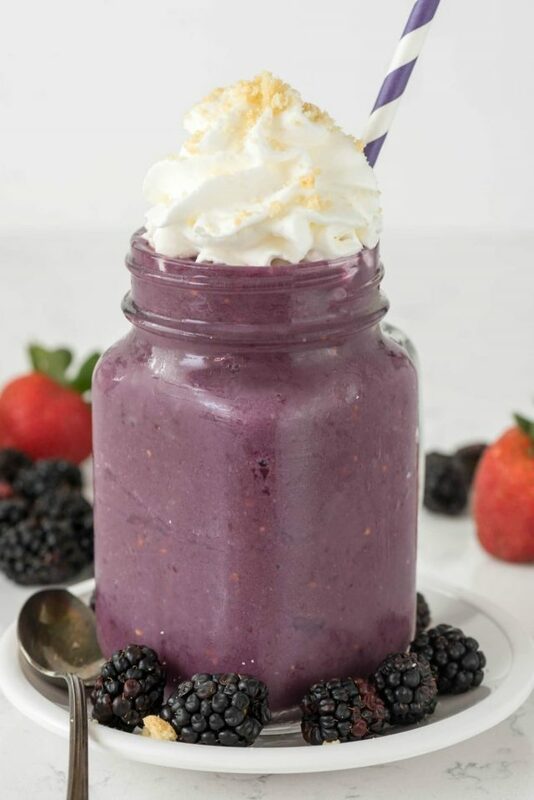 If you make this smoothie, let me know what you think and if your kids love it! I have a powerful blender that makes everything super liquid, so if I want it thicker I use less milk. If you have an older blender you may need more milk regardless. You know your machine, so blend accordingly. If you use dates or almonds it might be a good idea to roughly chop them first. Use your favorite almondmilk and your favorite almond butter – it’s all good! 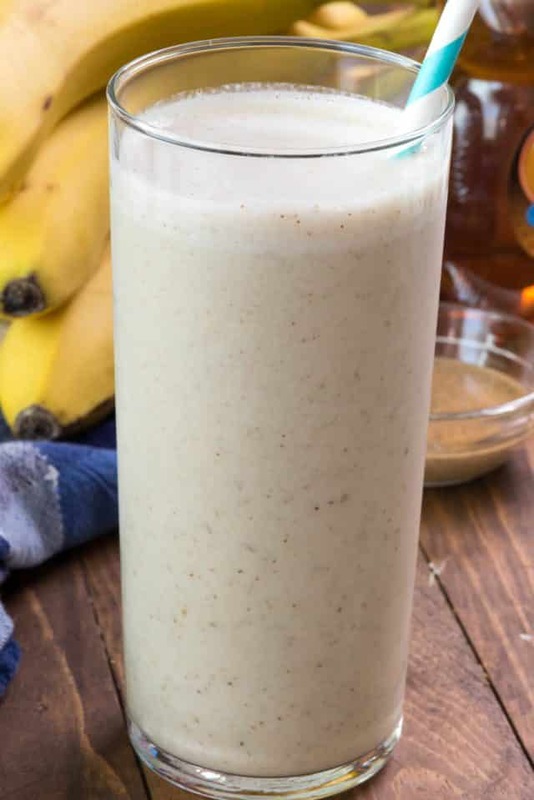 Honey Banana Smoothie - this easy smoothie recipe is full of bananas, honey, and almonds and kids LOVE it! It's just the right amount of sweet with some healthy and the perfect breakfast! Add all ingredients to a blender and blend until smooth. For a thicker smoothie, use less almondmilk. Survey done. Thanks for the recipe! All done with the survey!! That’s the only milk my daughter drinks– she loves the Almond Breeze unsweetened vanilla!! Delish! Took the survey. Use Almond Breeze in my breakfast quinoa warm! Survey done! And seriously can’t wait to try this recipe for Aubrey! I’m trying to eat a little healthier and this smoothie looks so good! I took the survey! I made this last night and tonight as a post workout shake. I added a small amount of vanilla protein powder and wowzers! This is great. Thanks for the recipe!